Chevy has always called the Corvette "America's greatest sports car." Now the 505 HP Corvette Z06 can call itself "America's top car" — well, as far as Consumer Repors is concerned. With the score of a 92 (out of 100), the screamingly fast Corvette Z06 was the top-scoring domestic car in the publication's road tests for 2012. But for anyone who thinks this means CR has dumped the dorky for the awesome, that score is just one point below the Toyota Camry Hybrid XLE. Also, they gave the Jeep Wrangler Unlimited a score of a 20. WTF is up with that guys? Kia's let loose with the first official photographs of its all-new flagship rear-wheel-drive sedan that'll be launched this summer in the Korean domestic market with the name 'K9.' 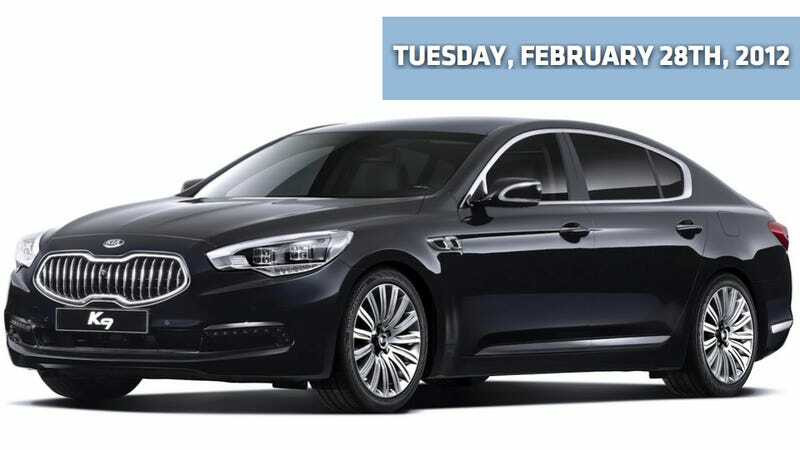 Although Kia didn't reveal anything else about the handsome new large sedan, since it shares the same platform as the Hyundai Genesis, we can likely assume they'll offer it with the same 3.8-liter V6, 4.6-liter V8 and 5.0-liter V8 engines. And frankly, given exterior styling that not only borrows from the BMW 7 Series, but carries it better, I'm actually a bigger fan of this RWD Korean sedan. The name the brand will use for export markets — along with overseas launch timings —will be announced later this year. For some strange reason and despite really unveiling no new cars this year (I'm sorry but re-badging the Chrysler Sebring as the "200" does not count as a new car to me) Chrysler is selling cars and making money hand over fist. So much money in fact that they're making Fiat profitable as a company. I can't tell you enough how much of an impact Olivier François. When people are buzzing about Chrysler in a good way it's usually because of him. That Clint Eastwood Super Bowl Ad had François' mitts all over it. As he reveals to Forbes, the man Imported From France was even smart enough to get out of the way and let Eastwood write it. Those French sure do get what Americans wants. So, according to Bloomberg, the gameplan for GM's Cadillac division isn't to take a run at BMW. No, it's to continue their war of attrition with Toyota by giving Caddy a strong enough lineup to overtake Lexus as the 4th biggest luxury automaker. So, does that make the ATS, rather than a 3 Series killer — actually an IS-killer? Speaking of the French. According to Bloomberg, Peugeot may announce this week plans to sell a 7% stake in the French carmaker to General Motors as part of a development alliance. The deal would involve a standstill agreement by which GM would not take a greater holding in the Paris-based carmaker without permission, said people familiar with the discussions, who asked not to be identified because the talks are private. Peugeot may offer additional shares through a rights issue as part of the transaction, the people said. Fans of random Japanese automaker videos like the fine folks at InsideLine have noticed something special in this video celebrating 30 years of the Nissan Technical Center. Specifically, the 2013 Nissan Altima without all the gaudy camo. Still looks beefy.